I am so excited! 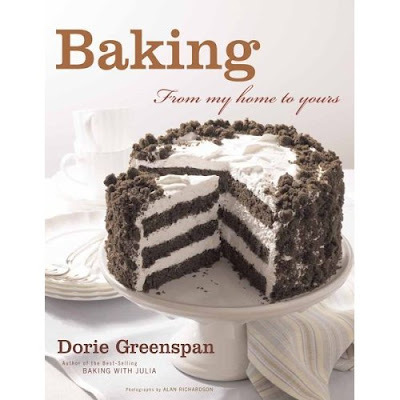 This is my first time participating in Tuesdays with Dorie- A group of bloggers that are baking their way through Dorie Greenspan's Baking: from my home to yours- by taking turns each week choosing a recipe, baking, and blogging about it. Everyone posts on the same day and I had a lot of fun! I have never attempted to make flan before, mainly because it isn't my favorite dessert, so this was a good opportunity for me to bake something I probably wouldn't have otherwise. There are a ton of options in the cookbook for "playing around"- which means switching up an ingredient or baking it with a twist. With this recipe there was the playing around option of Caramel-Topped Coconut Flan-where you use 1-15 oz can of unsweetened coconut milk instead of the heavy cream and reduce the amount of milk to 1 cup. I chose this option because it sounded yummy and I also took the option of baking the flan in ramekins instead of a cake pan. I think that individual servings are more fun. I used 8 4-oz ramekins and therefore skipped the warming of the pan. Also, you start checking for doneness at the 25 minute mark if using ramekins. Mine took about 40 minutes to bake. I also doubled the amount of caramel, to be sure there was enough for all of the ramekins. Doubling the caramel ingredients also doubled the cooking time for the caramel. Getting Ready: Center a rack in the oven and preheat the oven to 350 degrees F. Line a roasting pan or a 9-x-13-inch baking pan with a double thickness of paper towels. Fill a teakettle with water and put it on to boil; when the water boils, turn off the heat. Put a metal 8-x-2-inch round cake pan-not a nonstick one-in the oven to heat while you prepare the caramel. To Make the Caramel: Stir the sugar, water and lemon juice together in a small heavy-bottomed saucepan. Put the pan over medium-high heat and cook until the sugar becomes an amber-colored caramel, about 5 minutes-remove the pan from the heat at the first whiff of smoke. Remove the cake pan from the oven and, working with oven mitts, pour the caramel into the pan and immediately tilt the pan to spread the caramel evenly over the bottom; set the pan aside. To Make the Flan: Bring the cream and milk just to a boil. 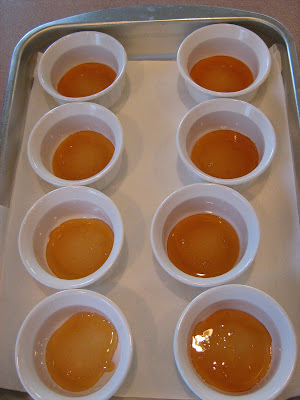 Meanwhile, in a 2-quart glass measuring cup or in a bowl, whisk together the eggs, yolks and sugar. Whisk vigorously for a minute or two, and then stir in the vanilla. Still whisking, drizzle in about one quarter of the hot liquid-this will temper, or warm, the eggs so they won't curdle. Whisking all the while, slowly pour in the remainder of the hot cream and milk. Using a large spoon, skim off the bubbles and foam that you worked up. Put the caramel-lined cake pan in the roasting pan. Pour the custard into the cake pan and slide the setup into the oven. Very carefully pour enough hot water from the kettle into the roasting pan to come halfway up the sides of the cake pan. (Don't worry if this sets the cake pan afloat.) Bake the flan for about 35 minutes, or until the top puffs a bit and is golden here and there. A knife inserted into the center of the flan should come out clean. Remove the roasting pan from the oven, transfer the cake pan to a cooking rack and run a knife between the flan and the sides of the pan to loosen it. 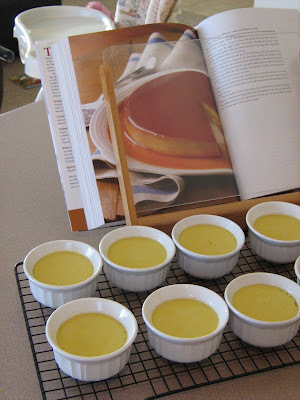 Let the flan cool to room temperature on the rack, then loosely cover and refrigerate for at least 4 hours. When ready to serve, once more, run a knife between the flan and the pan. Choose a rimmed serving platter, place the platter over the cake pan, quickly flip the platter and pan over and remove the cake pan-the flan will shimmy out and the caramel sauce will coat the custard. My biggest disappointment with how these turned out was mainly that the outside edge was not smooth at all so it didn't look as pretty as the picture. I had a hard time getting them out of the ramekins and I think that I loosened them too much with a knife around the edge. The best part about making the flan was serving one of these individual servings to my husband and awaiting his response. He took one bite- nothing. He took another bite and I started asking him questions. He loved the hint of coconut flavor and also loved the thin layer of caramel because it added just enough sweetness. He also liked the texture and finished his portion. I was amazed because he is picky and I thought for sure that he wouldn't like this at all. I stand corrected! Thank you Dorie and fellow bloggers for inspiring me to try something new and getting my husband to love it! Me again :-) Yes I missed story! I had the same problem when I released them, I guess I should have used a different knife. I think it looks delicious! I only wish that I could be closer so that I could taste all your creations! I love that you are getting Matt to be more adventurous too! They look yummy. Next time I'll try the coconut base like you did. It looks great, even with the debris. I need to get some ramekins, I love the single serving idea. I love your cute little flans!! They're so sweet! Welcome to the group! I didn't have any problem releasing mine, thankfully! I was tempted to try the coconut flavoured one, but didn't want to mess too much with my first flan baking experience. Just wanted to stop by and say that I really like your blog and have enjoyed reading it. I am brand new to the blogging world and decided to take some sneak peeks of fellow bloggers who deem some of my same interests. I am a home chef and an caterer, I will be creating a complete foodie blog soon. I am enjoying my personal blog right now and I am learning the ropes of the blogging world. It's nice to see real people posting real pictures of their own creations and or recipes they have tried instead of sticking stock photos you can find accross the net. Keep up the good work and I look forward to blogging with you. Congrats on finishing your first week with TWD! All those lil' guys look adorable! Great job! They look wonderful! Welcome!! Dont you love when you bake something that your hubs actually likes?? It makes me giddy. Welcome to TWD! Great job! Welcome to the group! I wanted to try the coconut but I didn't have the milk for it! Yours looks delicious! Mine didn't come out very clean either, oh well, still tastes good! I had the same problem releasing them from the ramekins. Mine took 45 minutes to cook, even in the small ramekins...strange! Good job! Isn't it satisfying when you can win over a picky eater with your cooking?! They look great!. Welcome to Tuesdays With Dorie! So glad you tried something new! That is exciting!! Great job with you coconut flan! Sorry, I'm a little late getting around to everyone. Your flans are so cute in those little ramekins!